Real, real strong turnout at today’s protest on the eve of the Republican National Convention. Certainly much larger than either of the anti-war rallies I attended in New York a year and a half ago. There may have been little shared ground among the protesters beyond opposition to Bush, but that message came through loud and resoundingly clear, and is about as much information as the mainstream media can be expected to communicate anyway. Speaking of which, the most telling moment for me may have been when thousands of us, in the middle of a protest easily several hundreds of thousands large, were causing a ruckus around the Fox News Headquarters. We looked up to the channel’s gigantic display overhead, and what was on Fox News? A discussion of the Swift Boat Veterans for Truth. That, ladies and gentlemen, is as concise a statement of the problems with the corporate media as any. The question hanging over the protest was what, in the event of a Kerry victory, becomes of this several-hundred-thousand-strong group, some of whom chanted Kerry’s name and others of whom wore masks mocking his face. How do those of us who identify as the left, re-energized and validated by the devastation wrought by the sitting President, organize with the same extent of urgency and breadth of coalition to hold accountable his replacement? 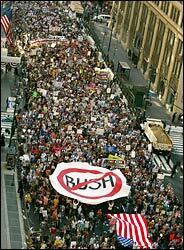 This entry was tagged activism, coalitions, Fox News, George Bush, GOP, John Kerry, media, protest. Bookmark the permalink.